My Sister in law gave me a beautiful plate for Christmas. Here is the website and picture. Thank you grammyk. It is an excellent thread! Why is it called stoneware if it looks like made of clay or china? But it is beautiful handmade art with folk motifs, indeed. Costs 181 per piece. * Boleslawiec (Bowl-e-swa-vee-etz) is located on the Bobr River on the German and Czech border. * This region of the world has been a potter's community dating to the 7th century. 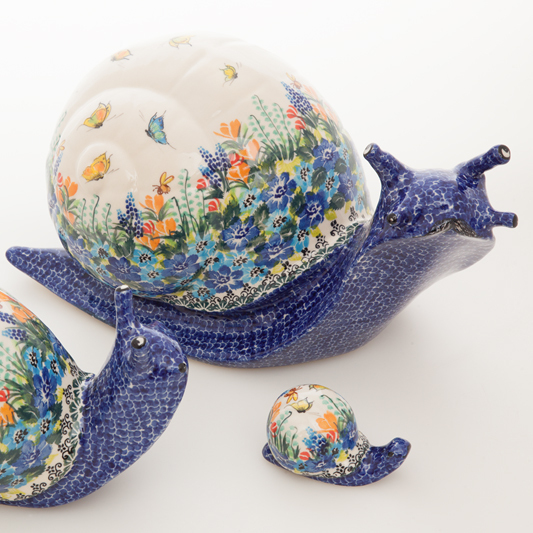 * "Ceramika Artystyczna-Artistic Ceramics" opened its production in 1950 in the former factory "Paul und Sohn" (1893-1945). The variety of production forms include numerous museum copies and traditional shapes. Stamped pottery decorations with the famous "eye of the peacock's tail" motif have been produced since the beginning of the 19th century and are recognized among the finest examples of European pottery. Village craftsmen and peasants of lower Silesia, inspired by the peacock's feather motif, have added incredible strength and beauty to these objects, which have long been admired for their quality and decorative appeal. 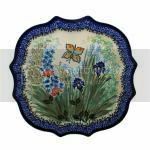 Each piece is hand painted and initialed/signed by skilled artisans. * A selection of original pieces can be viewed in a museum in Boleslawiec. This is incredible what these guys do. There are hundreds of patterns and forms. You`d better look at their site. 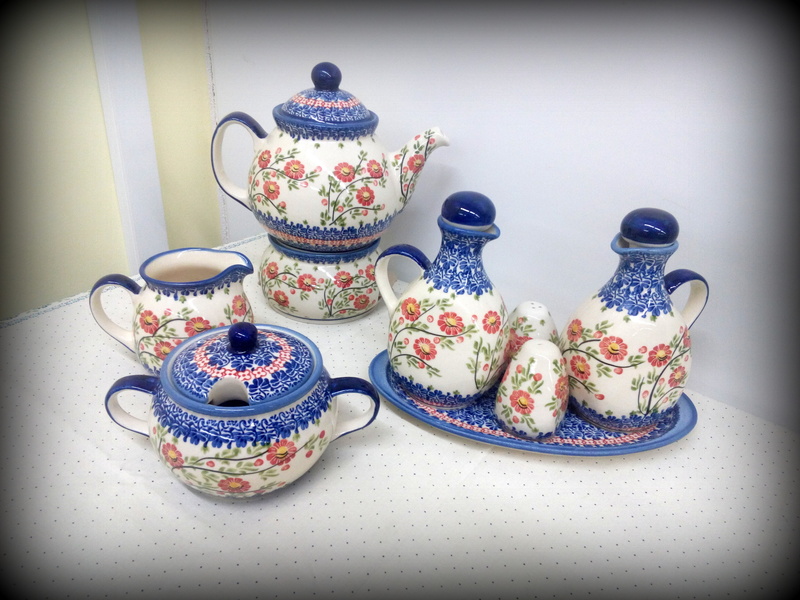 And here are tips and helpful info on Polish pottery. We receive containers monthly from Poland. The decorations vary in each container. Most products are available from our standard stock. Close inspection of each piece is mandatory before it leaves our facility in Connecticut to ensure the superior quality you expect. There will always be slight variations in decoration and color, and no two pieces are exactly alike. This is truly what make this an artform and a collectible. Working closely with the factory to develop new shapes and complementary decorations, we are able to maintain the integrity of the original product. Therefore what you purchase from us is an authentic reproduction of an original design. The Zanger Company offers hundreds of shapes in hundres of decorations. The combination of color palettes and shapes create an eclectic environment in your home, so representative of old world Europe. The decorations offer repetitive patterns which complement one another. A beautiful table is presented as a result of this mix and match technique. 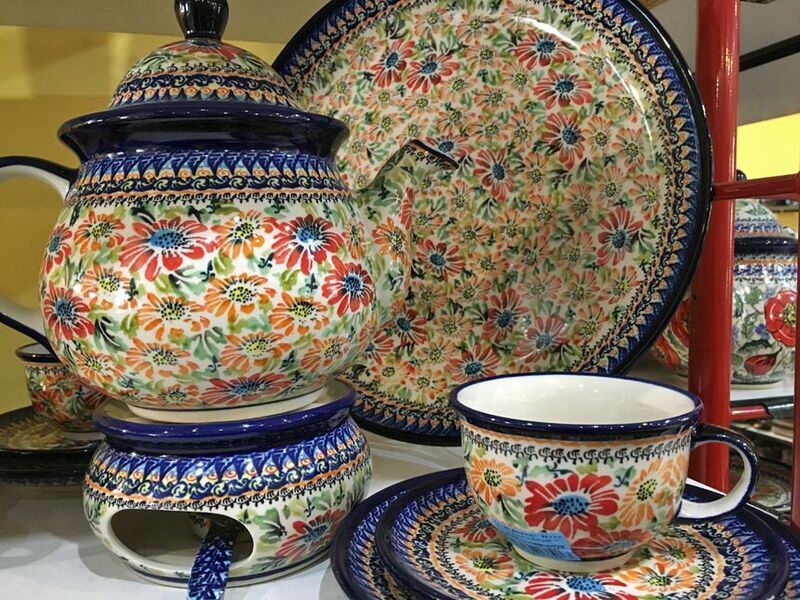 What makes Polish pottery special? Stoneware serves as a wonderful unit for storage. Fruit and other food groups remain fresher for extended periods when stored in our pottery. When using in the oven, our pottery provides an even heat distribution for cooking and baking. In addition, foods retain moisture when prepared in our pottery. I have some pieces of the Boleslawiec stoneware. I have one large and one small bowl, and a pie plate that I use to store bananas in. They are all in the Peacock eye pattern. I also have a small creamer and sugar bowl with a fir tree and snowflake pattern. I enjoy the beauty and quality very much! Thanks for your interest in the stoneware. I wasn't sure anyone would be. I think my plate is just beautiful. And it was such a surprise. My SIL and I don't normally exchange gifts, but she saw this and said she had to get it for me as she knows how much I like learning about my roots from Poland. The picture I posted is from the website. Mine is slightly different but as they all are a "one of a kind", hand decorated, numbered and signed by the artist. We are people of culture and artistic taste. Repeat question - why stoneware? 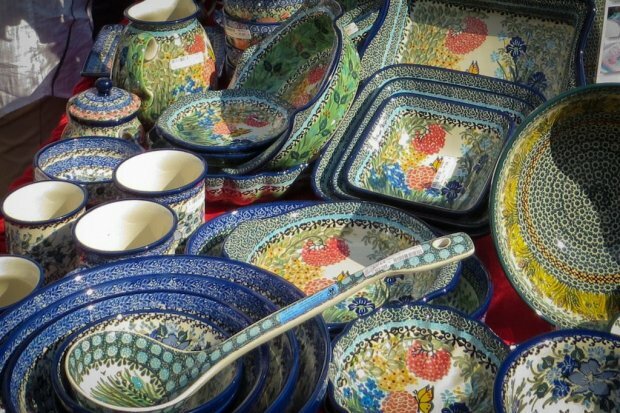 Stoneware; a vitreous or semi-vitreous ceramic ware of fine texture made primarily from non-refractory fire clay. "Stoneware, which, though dense, impermeable and hard enough to resist scratching by a steel point, differs from porcelain because it is more opaque, and normally only partially vitrified. It may be vitreous or semi-vitreous. It is usually coloured grey or brownish because of impurities in the clay used for its manufacture, and is normally glazed." In contrast, earthenware is fired at lower temperatures and is not impervious to liquids. Porcelain, which some consider to be a type of stoneware, is distinguished as being whiter than stoneware and always vitreous. Kaolin, or China Clay, has a lower content of impurities than many other clays. It is also fired to a vitreous state, transforming the constituent silica into glass. Some porcelain bodies are translucent after firing. Firing a piece of pottery to too high a temperature will result in warping or melting. Vitreous clay bodies can be made at different temperatures ranges, but they are typically fired in the stoneware/porcelain range. Fired stoneware absorbs up to 5% water, porcelain 0%, and earthenware up to 10%. Earthenware, when moist, is typically not freeze resistant. Clay refers to group of minerals that generally exhibit plasticity when mixed with water, and which chemically primarily consist of alumina and silica. Potters refer to combinations of clays mixed with other materials as clay bodies. Different kinds of clay bodies are created by mixing additives, such as feldspar, grog, quartz, flint, many other minerals are used and these can include spodumene, wollastonite to modify clays. Clay bodies can thereby be formulated to fire at a range of temperatures. Darker clays often contain iron and other metal oxide impurities. The clay used for porcelain and white stoneware clay bodies contain very little of these impurities. Glaze may be applied to stoneware pottery before a second firing at a different temperature, or a glaze may be applied before a single, raw firing. American Stoneware became the dominant houseware of nineteenth century America. These are really beautiful pieces. Cobalt blue is one of my favorite colors for dinnerware, serving pieces, glassware, etc. We have a full service for ten, that we use each day, and love it. We also have many others. I hope some day to leave this all to my children, after I pass. Don`t think about passing. Enjoy life and be good to all people. How come we have neglected this thread for so long? 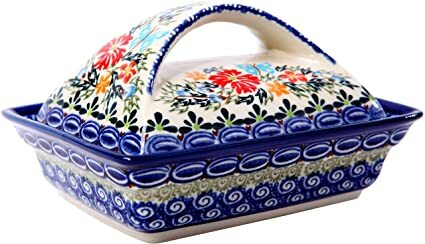 I really, really like this Polish pottery. I like how most of it is in shades of blue (my favorite). I have a real weakness for it and when I see a nice piece, I am sorely tempted to buy it. Alas, I live in a small house with limited cabinet space, so I have been pretty self-controlled up to this point. Occasionally, one of my daughters will buy me a piece, and of course, I can't refuse a gift! 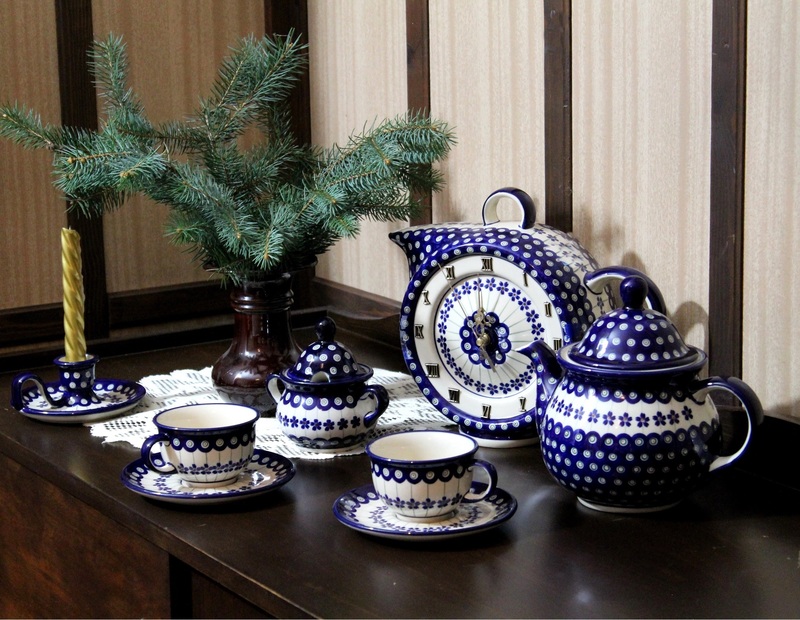 I really, really like this Polish pottery. I like how most of it is in shades of blue (my favorite). Judging from multiple photos, it seems blue is the favourite colour for pottery manufacturers. I wonder if there are any historical factors behind it, like the availability of blue in old times. Hmmm...that is an interesting question... It started me thinking about other blue china, most especially the old and traditional Blue Willow pattern china, which is totally blue on white. Is this pattern common in Poland? It's a very common one in the U.S.
most especially the old and traditional Blue Willow pattern china, which is totally blue on white. Is this pattern common in Poland? It's a very common one in the U.S.